Same proven formula thats served the gunsmith industry for decades with a couple of new advantages: its pre-mixed at just the right potency for everyday gun cleaning and is bottled in a new, spray pump applicator so you can put just the right amount of cleaner exactly where you need it. Replaces harsh solvents to remove built-up powder residue, carbon and other crud inside your guns action and bore, plus sparkles up the exterior, metal surfaces as well. With a small brush, is unsurpassed for cleaning old, gummed-up checkering and removing caked-on grime from gunstocks. And, it dissolves tough dirt on hunting and camping gear. 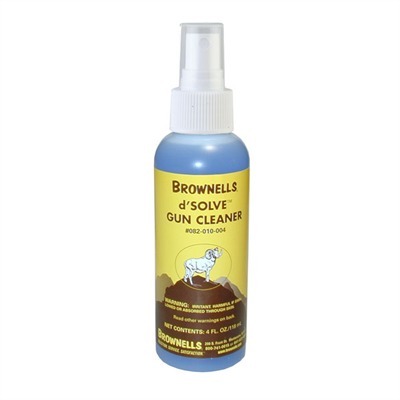 Odor-free so it wont stink up your work ar Mfg: Brownells SPECS: 4 oz. (118ml) plastic, spray bottle.